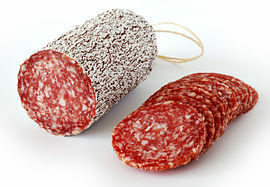 Winter salami (Hungarian: téliszalámi) is a type of Hungarian salami produced according to a centuries-old tradition. Made from Mangalitsa pork and spices (white pepper, allspice, and others), winter salami is cured in cold air and smoked slowly. During the dry ripening process, a special noble-mold is formed on the casing surface. Szegedi téliszalámi (winter salami of Szeged) gained European Union PDO status in 2007, followed by Budapesti téliszalámi, which gained PGI status in 2009. The Hungarian Ministry of Agriculture and Rural Development places many specific regulations on what can be called Szeged winter salami. Pick Szeged is one of the most successful producers of this style of salami. ^ "Herz salami 1888". Archived from the original on 2016-03-07. ^ "Protected Designation of Origin". Archived from the original on 2008-08-04. ^ "Hungarian Ministry of Agriculture". Archived from the original on 2012-02-11. ^ "Pride in our Company". Archived from the original on 2009-05-19. "Mangalica Breed Pork". Archived from the original on 2014-11-29.